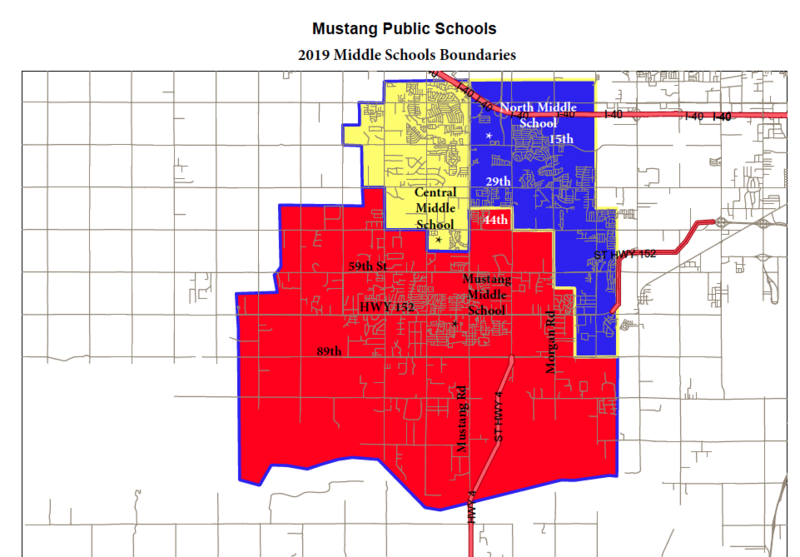 The Mustang Board of Education approved middle school boundaries for the 2019-2020 school year in preparation for the opening of Central Middle School in August. The boundary realignment will populate the new middle school while taking population pressure off Mustang North Middle School and Mustang Middle School. While valuable for both middle schools, this is particularly beneficial for Mustang North Middle School which has nearly 1,000 students. Mustang Middle School had 786 students for the 2018-2019 school year. Projected numbers for next year with the opening of Central Middle School are 511 students at CMS, 712 at MNMS and 644 at MMS. The new boundaries are expected to accommodate student population growth for several years. Parents of children who will be moving will receive a letter notifying them of the change. If the 2019-2020 school year will be an “exit year,” parents may fill out the exit year transfer request so their child can stay at their current middle school for their eighth grade year. The form should be filled out and returned to the student’s current school site by March 4, 2019. Transportation is not provided for students on an exit year transfer. You may email any questions or concerns to boundary@mustangps.org . To see a PDF of the map, click here. 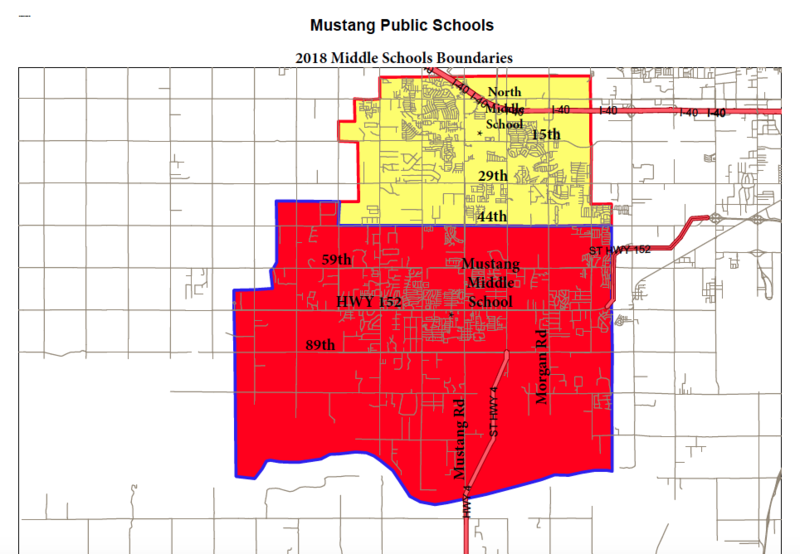 Current boundaries for Mustang Middle School and Mustang North Middle School. These boundaries will be in effect until May 2019. Please see the boundaries above for the 2019-2020 school year which will also include Central Middle School. Click here to see a PDF of the boundaries.